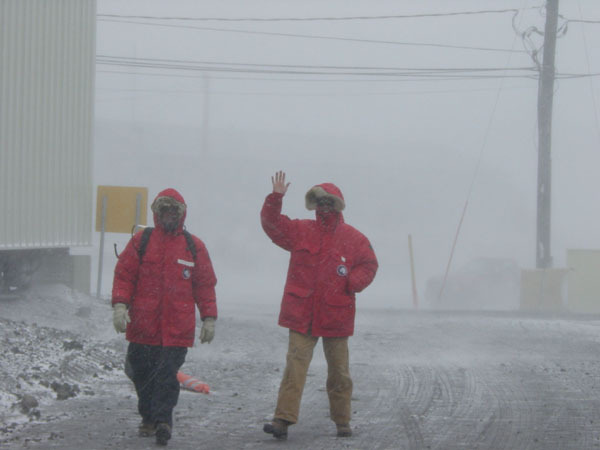 Two McMurdo residents venturing into the storm. Click for a larger image. When hurricanes approach the coast of Florida, there are usually a few hardy (or perhaps foolhardy) souls that stay behind instead of evacuating. Ive heard that they will sometimes congregate at the local watering hole, board up the windows, and party until the storm blows through. 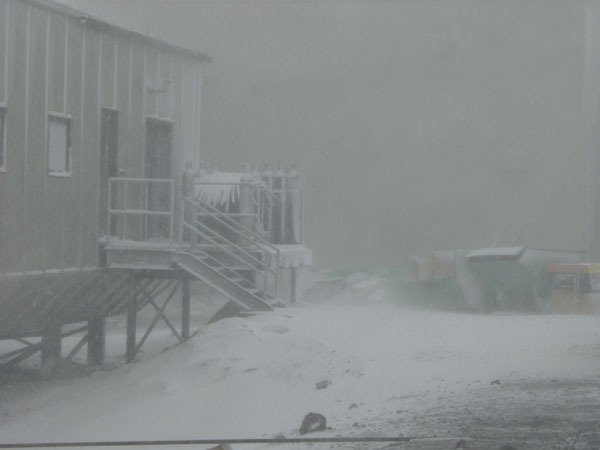 We had the equivalent of a hurricane party the other night at McMurdo station when a blizzard blew in from the Ross Sea. Our first two weeks in Mactown have been blue skies and sunshine-and this was the first real weather Ive experienced here (although Paul and Noel had some bad-weather days on Mt. Erebus). When the storm hit, it was easy to get infected with the high spirits of the locals. It was pretty exhilarating walking from one building to another in 60 mph winds with sharp snowflakes driving straight into our faces. The wind was so loud it sounded like a fighter jet screaming through town. Fortunately, the visibility was pretty good in town, at least we could see from building to building. In severe blizzards, sometimes whiteout conditions can mean that you cant see your hand at the end of your arm. By the mid-afternoon, the weather forecasters called "condition one" outside of town, which meant that everyone in vehicles or fields stations away from McMurdo had to hunker down in shelters to wait it out. The trip that Julie and I had planned to visit the penguin colony at Cape Royds was cancelled; I heard later that they lost some buildings and tents out there because of the high winds. In McMurdo, we were in "condition two," which means that people had to use caution when going outdoors and to travel around in pairs. By the evening, impromptu "condition one" parties were organized, and there was much dancing and revelry into the wee hours of the morning. The view from our Crary office window. Click for a larger image. The next day, I went down to the weather office and chatted with the weather forecasters Chester Clogston and Jim Frodge. 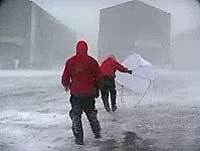 The storm itself was unusually severe for December and was estimated to be the size of France. It stuck around for four days and halted all the air traffic into and out of McMurdo Station until today. Yesterday morning when it finally cleared up, crews started digging out the airfields and clearing snow from the runways. With ten-foot drifts burying planes and buildings out at Willie Field, the snow shovelers worked all day and night so the first plane could leave at 10:00 this morning. Noel and I were scheduled to fly to the South Pole this morning, but that flight was cancelled. Were told that well go out early tomorrow morning. Things all around seem to be getting back to normal, and the day was bright and clear, the temps reaching up into the 30s.